The Epic Edition 15 of the Red Bull Romaniacs was destined to go off with a bang: It started with a new, colourful opening ceremony introducing the competitors of 53 participating nations. Each of the 53 nations were represented by a rider carrying a flag over a ramp in front of hundreds of fans, locals and somewhat surprised, unexpecting tourists! Martin Freinademetz used the opportunity to welcome everybody, crack a few jokes and emphasize on the positive impact that the Red Bull Romaniacs has had on the international image of Sibiu. Meanwhile, on the Boulevard Coposul, the final nails were being hammered, rocks being dumped and water troughs filled in preparation for the infamous prologue. 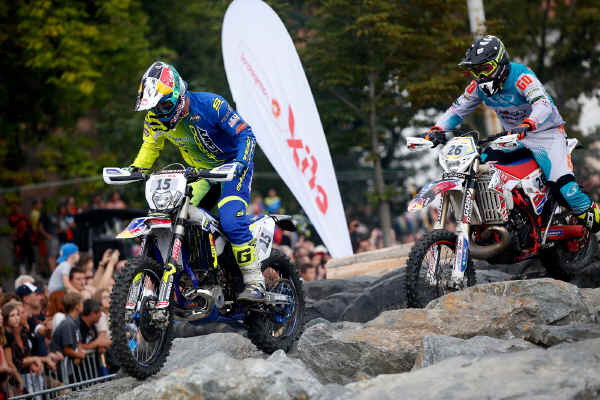 Like in most of the 14 editions before, the prologue welcomed the Red Bull Romaniacs competitors by spreading shock and awe among all classes. The first walk-by`s left many riders with the assumption that they had given themselves up voluntarily into Enduro hell and there would be no chance, anyone could ride this prologue. The first tests by Gold class riders seemed to confirm that impression: many were struggling not only to find a line, but to basically stay on the their bikes. The tests revealed that the “Epic 15” section was the one to be most feared and the Rompetrol section with the upright truck wheels actually proved to be the more difficult one. In the end, even the Silver and Bronze classes were surprised that they somewhat managed to get through this 2018 prologue, while the Gold class competitors fought out fierce “high speed” battles. Weatherwise, this mornings time trial qualifiers started out relatively dry for the Bronze and Silver class, with just a bit of rain - by the time the Gold class went, the heavens opened up in true prologue style. As luck would have it by the time the Gold class were lined up for their finals the track had dried out enough to give competitors the extra confidence they would need to hit the obstacles with some force. This was soon to become evident as the riders charged off the start line with ambition and determination, leaving the crowd stunned with excitement. Billy Bolt did not waste any time in establishing himself in the lead and had no intention of letting it go. He rolled over rocks and logs as if they didn’t exist. He got into his groove from the beginning and he maintained his rhythm. Billy had a flawless run today. By the 6th lap, he had ridden out such a big advantage, that he was about to lap Mario Roman. Mini Letti was hot on Bolt’s tail followed by Pol Tarres, Wade Young, Taddy Blazusiak and Jonny Walker until about halfway through. Mid-race, Mini and Taddy were battling it out and seemed a perfect match on performance and technique until they both got stuck - allowing Wade Young to sail by and secure his best position ever in a Red Bull Romaniacs prologue, a 2nd place. Mini and Taddy seemed to continue in a battle of their own, back and forthing, side by side to the finish line. At the end, Taddy managed to just inch far enough ahead to score the 3rd spot on the podium. Meanwhile, defending champion and six-time Red Bull Romaniacs winner Graham Jarvis showed off with magnificent riding technique, but - as expected played it safe during the prologue. He seemed to be focused on finding clean lines, riding gracefully over everything and avoiding any other contact with fellow competitors. Jarvis finished 7th and smilingly stated after the prologue “It is going to be a long race”... Paul Bolton was 8th and Nathan Watson 16th. Brazilian Gianino Coscarelli took the Bronze lead ahead of Fabien Choffat and Matthew Hannaford. Ed Warren was 17th. Damon Siviter Brynstore.com 21st, Ashley Topham 26th, Gary Mccoy 31st, Matt Watterson 38th, Paul Westgarth Eurotek KTM 41st, Chris Ball 42nd, Gethin Francombe 125th. The hero of the day is Mario Roman. He did one of the boldest maneuvers that spectators got to see during the Red Bull Romaniacs 2018 prologue. At the teeter-totter at the entrance of the “Tiki-Taka” section, he realized a jam after the obstacle and immediately reacted - getting airborne and switching to the ramp next to him. He managed the switch - which looked like miracle-work - but was unfortunately unable to exit the teeter-totter properly and ended up crashing. The 2018 Red Bull Romaniacs prologue presented itself in all its looming glory, with its twelve technical obstacles, the longest being over 53 meters to represent the 53 nations competing. Prologue manager, Andy Fazekas, used approximately 120 tons of rocks, 120 tons of lumber and heavy metal style industrial machinery to form all the man-made obstacles which flowed into each other. Even the top guns commented on how there were just no “breaks” in-between obstacles. 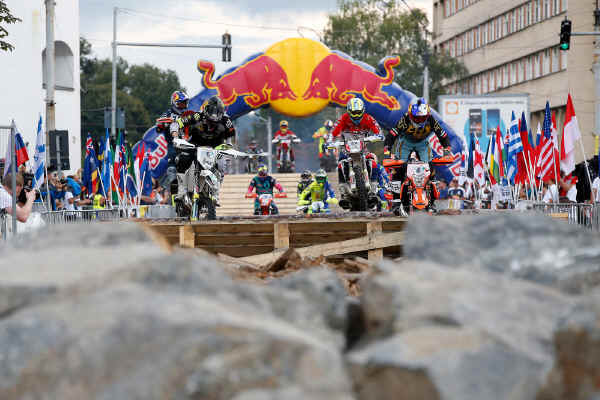 The Red Bull Romaniacs was the first ever hard enduro event to introduce an inner city prologue and it is definitely a signature event at this rally, attracting thousands of spectators and media. Andy Fazekas has gifted competitors and fans with his unique creations for all of the 15 editions and was heard saying that this year was going to be the “Mother of all prologues, rideable for all classes but tough as nails”! It seems he nailed it again!